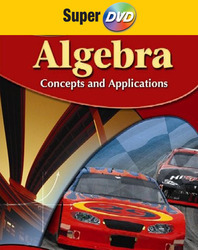 Glencoe Mathematics Super DVDs are the ultimate in math classroom videos. The DVDs contain a combination of real-life applications from our award-winning What's Math Got to Do with It? videos that use math in real-life situations. Correlated to the Student Edition, the videos include relevant, problem-based learning examples, and assessment in the format of an engaging game show from our MindJogger Videoquizzes (available in VHS).